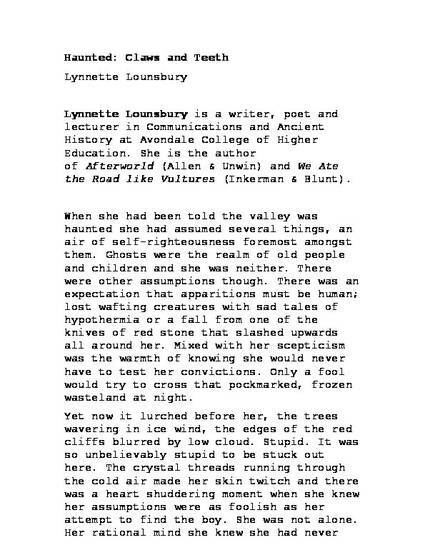 This piece is the written and edited version of a previously performed oral piece that was part of the creative component of Australian Association of Writing Programs Conference, 2015, Swinburne University, where they were exploring the idea of the relationship between text, place, and voice in the realm of supernatural writing. The submission criteria asked for creative texts that responded to the idea of haunted people, places and supernatural experiences with an eye to live performance of text. The written versions were then reviewed for publication in the journal Bukker Tillibul: The Online Journal of Writing and Practice-led Research. This piece explored the concept of haunting as a textual provocateur. It further explored the idea of the animal in the haunted space as an alternate spirit to that of the tradition human ghost and the roles animals play in linking humans to the past through place. Used by permission: Bukker Tillibul and the author. This conference proceeding may be accessed from the publisher here.